Just when you thought you might have missed a chance to win a free 3-day pass to RootsTech 2016 in Salt Lake City, Utah, here is one more opportunity. You won't want to miss this year's RootsTech. Pulitzer Prize winning author, Doris Kearns Goodwin is just one of four keynote speakers who will inspire and entertain you. You can read all the details about the keynote speakers here. Family Discovery Day also has a great line-up of speakers who will be sharing their stories of family history. 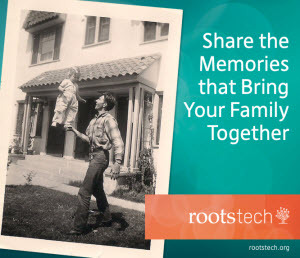 So, what do you need to do to enter to win a FREE 3-day pass to RootsTech? Remove the brackets and the word at. Insert @ instead. In the body of the message, put: "I want to go to RootsTech!" Include your name and email address. Deadline for all submissions is Friday, December 4, 2015 at 11:59 pm ET. Entries providing the requested information will be submitted to an online random prize generator. The first name chosen will be deemed the winner. The winner will be announced Saturday, December 5, 2015 at 12:00 noon ET, and will be contacted by email to receive the prize certificate. *If you have already registered to attend RootsTech, no problem. Enter the giveaway contest anyway. The prize certificate contains information on how to have your 3-day registration refunded. ** By entering this giveaway contest, you do so at your own risk, and hold Kathryn Lake Hogan and Looking4Ancestors blameless for any and all consequences associated with this contest and its prize. Copyright by Kathryn Lake Hogan, 2015. Subscribe to our Genealogy with a Canadian Twist Weekly Webinar mailing list. Get all the information about the weekly topics, registration and webinar replays right to your inbox. To find out more about our cookies policy, click on the Policies tab from the top menu.